Russell Tyler, born in 1981 in Summertown, TN, is an up-and-coming American hard-edge painter whose work has been catching critic’s eyes in group exhibitions over the past couple of years. 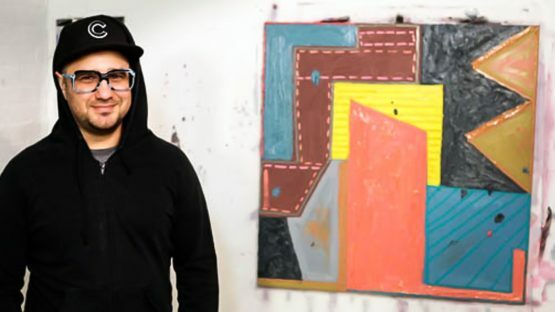 He uses oil paint as his medium, applying it to the canvas very thickly, using large brushstrokes and loose brushwork, consequently giving his paintings hard-edged look and linear form, emphasizing interplay between fields of color, making it almost seem as each of his paintings is a powerful, three-dimensional object. Tyler graduated from Concordia University in Montreal, Canada and got his BFA degree in 2006, and in 2010 his MFA from Pratt Institute in Brooklyn, New York. Frequently turning up in his recent work are black squares and gray-scale bands, relatable to blank computer and TV screens, giving his work allusions of functionality with their fluid but rigorous geometry and thickly painted, bright and vivid rectangles, trapezoids and circles painted on conventionally rectilinear canvases as well as tondos, reminiscent of the 8-bit graphics of primitive computer programs and video games. Tyler, whose generation was among the first to grow up in front of computer screens, wanted to evoke the games he played as a child. In this light, Tyler’s paintings are as much about lost innocence as they are about lost technologies. Tyler’s transfer of childhood sensations from a digital past to an analogue future in paint is an acceptance that experience cannot be relived, and an assertion of painting as a repository of the irretrievable. At the above-mentioned show Tyler has hung his paintings on display in related pairs, as well as five corresponding canvases grouped together and a couple of single tondos. Images appearing in the paintings are large, gradated rectangles, one on top of the other, rising like a staircase, as well as an intensely colored central form squeezed between black or gray borders. He used lines of paint as framing devices, squeezing the paint out of a tube along the perimeters of the rectangular works, and a swath of carefully removed paint around the circumference of the tondos. Also, Tyler carefully painted the side edges of the canvases and wood panels, most often with a color used on the surface. Other solo exhibitions include B15 Gallery in Copenhagen, Fouladi Projects in San Francisco, EbersMoore Gallery in Chicago, and Freight + Volume in New York. Group exhibitions include Acid Summer at DCKT Contemporary as well as exhibitions at Denny Gallery, and James Graham & Sons in New York, and Mark Wolfe Contemporary Art in San Francisco. Tyler currently lives and works in Brooklyn, NY.